There are few places on this blue planet that can match the marine diversity found along the shores of Southern Africa. Two very different oceanic currents flank the coast of the southern tip of the African Continent. The west coast of Southern Africa is surrounded by the cold Benguela Current and on the east coast the warm Agulhas Current moves south from the tropics. These two currents create not only two radically different marine environments but also shape the terrestrial ecosystems and the human settlements along the South African coast. The cold Benguela Current host one of the largest wind driven upwelling systems in the world, as the dominant and strong south easterly winds push coastal surface waters offshore forcing deep, cold and rich-nutrient waters to wells from the depth. When this cold soup full of nutrients reaches the sunlight at the surface it triggers one of the richest marine environment on earth dominated by large production of plankton and massive kelp forests that fringe the rocky shallow coast. Giant kelp plants dominate the shallow reefs along the Benguela and it is under the shelter of this golden forest that there are a myriad of life with many endemic species. The abundance of kelp also feed the shores as plants and particulate seaweed fuels grazers, filter feeders and scavengers waiting on the rocks and sandy beaches. The west coast of South Africa has some impressive records as the world largest biomass of marine flesh of grazers per unit of rock. On the east side of Southern Africa the warm, fast flowing current moves south from the Mozambique Channel. This is the intense Agulhas Current of about 100km wide and surface water reaching speeds of 2 meters per second. 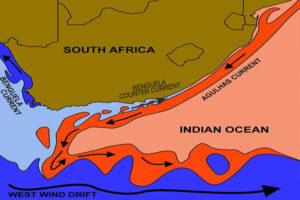 The Warm Agulhas Current creates a much benign environment as the warm ocean releases more moisture into the air generating more precipitation and creating a much greener landscape on land. Many more rivers enter the sea compared to the west coast and many more people settle along these shores, as fresh water is more abundant. For the first time semitropical flora and fauna is seen along this coast. The first large mangrove forests are found along the Mgazana Estuary on the Wild Coast. During the months from May to July, the cooler Benguela current strengthens and moves up towards the east coast of South Africa (termed the ‘Benguela counter current) and the warm Augulas current weakens and flows off the continental shelf. This cold counter current ‘finger’ of the Benguela current extends northwards along the eastern cape of South Africa, and up into the KwaZulu-Natal province. It is this cool northwards current that opens a migratory pathway for the sardines to move northwards towards KwaZulu-Natal. Some oceanographic variables have been found useful for describing conditions influencing sardine presence. Water temperature has an inverse and highly significant influence. This is consistent with the preferred temperature range of sardine. Sea currents have a significant effect, with calm current conditions most favourable for sardine presence and moderate current speeds from north to south most detrimental. As sardine movement during the run is northwards, this counter-current effect is expected. Increasing atmospheric pressure: sardine presence appears to be higher during periods between the cold fronts along the KwaZulu-Natal coast. These periods have calm atmospheric conditions and slow nearshore currents. Large swells and low water clarity associated with cold fronts have a negative effect on sardine presence. North-easterly winds cause the surface water layer to move away from shore, allowing the cool water to reach the surface (good for sardines). Alternatively south-westerly winds push warm Agulhas Current surface water towards the shore causing inshore temperatures to increase, which would negatively impact upon sardine presence. Strong south-easterly winds and rainfall are associated with the passage of frontal systems, which would push warm surface waters shoreward resulting in warmer sea surface temperatures would negatively affect sardine pressence. Frequent light north-westerly land breezes: When north-westerly land breezes are the strongest winds of the day they have a cooling effect on sea surface temperature. This cooling should be greatest in the vicinity of the surf zone where mixing is most effective. Sardine are often sighted close inshore during early mornings, suggesting that they could be attracted by cooler conditions found there. River water – cool waters from rivers can cause localised drops in water temperature that are attractive to sardines. Along the eastern cape, such pockets of mixed ‘river’ water are often associated with sightings of sardines.